Amy joined American Rivers in 1998 and is based in Portland, Oregon. She directs our national marketing and communications efforts covering campaign strategy, media relations, publications and online efforts. 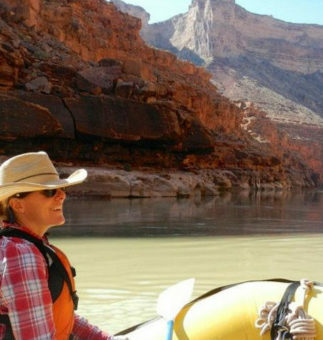 She has led successful communications campaigns around high-profile issues including dam removal, flooding, clean water, and wild river protection. She leads the organization’s annual America’s Most Endangered Rivers™ campaign, one of the most well-known public engagement efforts in the conservation community, and she oversees the organization’s creative storytelling initiative, which has resulted in a series of award-winning films. Prior to working at American Rivers, Amy taught environmental education at the Wellfleet Bay Wildlife Sanctuary and the North Cascades Institute. Education: B.A. in Creative Writing and Literature from Trinity College in Hartford, CT. Amy studied coastal ecology with the School for Field Studies on Vancouver Island, British Columbia and spent a semester in Florence, Italy studying literature and art history. She completed field ecology programs in Panama through the University of Florida and in Big Sur, California through San Francisco State University. Favorite River: Any river with my husband, our kids and dogs, and our driftboat!